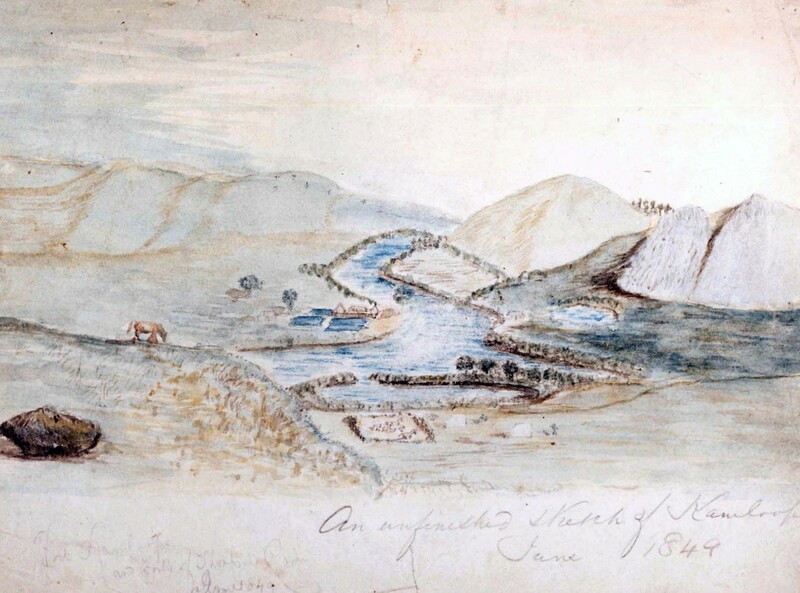 Alexander Caulfield Anderson’s 1849 painting of the Kamloops post, courtesy the Kamloops Museum & Archives. The early post is on the right. In 1843 the larger post was built on the west back of the North Thompson River (to the left); this is the post that Paul Fraser took charge of. Paul Fraser joined the NWC on May 7, 1819, for six years as an apprentice clerk. He worked at a variety of posts east of the Rockies and was managing Fort Vermilion [for the HBC] when he was transferred to the McLeod Lake post in 1832. Becoming chief trader in 1844, he was the originator and subject of much correspondence and in 1846 found himself in charge of New Caledonia when Donald Manson was temporarily relieved of his post… He used Waccan Boucher as his enforcer at Fraser Lake and appears to have become somewhat excessive in his own enforcement. He was under a cloud due to his drinking habits in 1850 and led a group of twenty-four men from York Factory to Edmonton [in the incoming York Factory Express?]. He then resumed control of Thompson River [Kamloops] and it was here around 1855 that Fraser’s disciplinary excess appear to have led to the death of Michel Fallardeau, though records supporting this are difficult to track. On July, 1855, while he was reading correspondence in his tent on Manson’s Mountain, on the HBC brigade trail between Fort Hope and Campement des Femmes, a tree fell on him killing him. He was buried on the trail the next day. Because he died soon after Fallardeau, an air of suspicion has hung over the circumstances of his own death but it appears to have been an accident. Thurs. 20th [November 1845] Fine. Cold. Express party arrived, Mr. C.T. Fraser & 3 men. Tues. 25th. Fine. Express party off. Nothing new occurs. Friday 19th [December] Marineau arrived from Ft. George. Eight of his horses have remained along the road. Five of these were left at W[est] Road River being tired; but as they are in an excellent pasturage with long grass & prele [horsetail], there is little to apprehend as to them passing the winter. Two others are close at hand, & will be sent for in a day or two. The remaining one is doubtless dead, having been left weak and sick upon the road. By referring to the entry of 24th ulto, it will be seen upon what terms I supplied these horses for the accommodation of Mr. Fraser’s party; and I am now compelled to remark that the promise then made by Mr. F. has been [infringed]. Marineau on several occasions (as he tells me) represented that owing to the snow being deeper than was expected in the portage, it would be advisable not to take the horses further; but to no purpose. Now if any material loss should accrue in consequence of this refusal, I must say that the responsibility remains with Mr. Fraser. Be this however as it may, this is the last time that I endeavour to accommodate any person or party with horses, at this advanced season, without having special directions to do so. Fort Langley buzzed with the news of the gold rush in California. To deter desertions, the gentlemen allowed a shorter break [at Fort Langley] than was usual, and the work of the return journey soon began. There was no disagreement between Anderson and Manson this year, but Douglas reported to Governor Simpson that Anderson and Paul Fraser had argued. Both Paul Fraser and Alexander Anderson had brought out their children to go to the school at Fort Victoria. The Anderson children traveled from Fort Langley in James Douglas’s canoe, but the two Fraser children (Peter, and Margaret) took a ride in the little ship, Cadboro, to Fort Victoria. Both batches of children would come to Fort Langley the next summer to meet their parents. After a year at Reverend Staines’s school, Paul Fraser’s children had forgotten their mother’s native tongue and could not communicate with her. In 1850, a number of brood mares were forwarded to Kamloops post from Fort Vancouver, the first breeding stock for the brigade horses at Kamloops. However, many were lost on the way. Douglas wrote to Fraser: “It is unfortunate that so many of the Mares, sent on from Fort Vancouver, should have been lost on the way. I trust [they] will now be carefully attended to as well as the other live stock at Thompson’s River.” Considering his past history of lack of care for the HBC horses, perhaps Paul Fraser was the wrong man to entrust with this duty. However, he does seem to have produced a sizable number of horses for the brigades every year. It being considered desirable to remove the post at Kamloops to a more convenient situation recommended by Chief Trader Fraser, about 8 miles distant from the present site, I beg you will examine the place, with reference to its capabilities and if you agree in opinion with Chief Trader Fraser, that there is a sufficient extent of good land to form a tillage farm of 300 acres, with an extensive cattle range, and that it is not too inconvenient for the Natives who trade there, I would strong recommend the removal of the Fort, and have in that case authorized Mr. Fraser to commence building on the new site. Donald Manson viewed the site proposed by Paul Fraser, and did not approve the move. In 1852, Paul Fraser reported to Governor Simpson on the success of the horse raising now done at Kamloops post: “I am happy of Stating for your information, that the Band of Brood Mares and Cattle are all doing well and Increasing fast, and I hope in a couple of years from this that Thompson’s River will be able to meet any reasonable demand in Horses,” for the Brigades. In the end, it seemed that the more horses the Kamloops farm produced, the more were needed in the brigades! Horses, or the lack of them, was always a huge problem for the HBC men of this era. Donald McLean did not have a gentle tongue, and I am sure he had something to say to Paul Fraser when he next rode out with the brigade to Kamloops. I have lately returned from Fort Langley, where I met the Brigades from the Interior on the 1st of inst. [July], under the charge of Chief Traders Manson and Fraser. Their arrival was later than usual in consequence of heavy rains and flooded Rivers, which caused much delay on the journey. The death of poor Fraser is most unfortunate, a grave on a lonely mountain is the reward of 40 years wandering in the Indian country. I have just learnt that the tree which caused his death was felled by one of the men, and took a wrong direction. Strange that they should fell trees so near a tent and in the very midst of the camp. If he was so curt with his brother officers, we may well imagine what must have been his temper while dealing with the servants. At that time clubbing and flogging were the devices resorted to in order to enforce obedience or punish a wrong. Now, it happened that for some offence, the nature of which is not remembered, he gave (at Kamloops) to one of his men, a French Canadian named Falardeau, such a brutal beating that the poor fellow died of it. As Baptiste, an Iroquois, was planing and bending the planks intended for the luckless man’s coffin, Fraser happened to pass by. “Hehm! when you die you may not have even rough boards to be buried in,” observed the laborer. Two months later Paul Fraser was on Manson’s Mountain, seated in a large tent by the side of [William] Manson, who accompanied his brigade, and the men were variously employed in preparing the camp when a crash was heard, and a big tree, which a Canadian was felling, came down on the tent, instantly killing Paul Fraser, who was reading his correspondence. So it was that he who had grudged a decent coffin to the victim of his own brutality had to be returned to Mother Earth without any kind of coffin. Paul Fraser’s full name was Paul Amelia Fraser. His oldest son, John, joined the HBC at Fort Vancouver in 1849, and died of poisoning of some sort at Chinook Point in 1863. Fraser had two daughters at least (besides above mentioned Margaret), both of whom lived at Victoria for some time. The family had come down from Kamloops in a Native canoe in 1855 or thereabouts, to Fort Langley. They traveled by horse to Granville (Vancouver), and by steamship to Victoria. They both married: Amelia Beckman lived in Vancouver and was alive in 1935, and Isabella (born November 18, 1850 at Kamloops) died in Victoria in 1935 (She was the widow of Alexander Holmes). It is not known what happened to the other children (or at least, I don’t know). If any one does know, please let me know, as I have people asking me if there were any. Two things come immediately to mind-(1). What was the recruitment ‘climate’ into the trade in the 1850’s and (2). Can Morice be relied upon as a source when attempting to re-construct the fur trade in this period? I don’t think Morice can be relied on. I presume he read the Fort St. James post journals which were still there, but when I check them, I don’t find the things he mentioned. Will look for this, though. I have them (the FSJ PJ) on order once again. The last time I ordered them the library was so cold I couldn’t handle sitting and freezing any more. Recruitment? No one would join the fur trade anymore. Shetland Islanders were moving to Australia. French were now in the logging industry. The employees that entered the district came from Red River and the Saskatchewan, and were metis. Gents? I think everyone in WA at least was trying to get out of the fur trade, rather than work in it any longer, as the pay was so poor. We seem to concur. I’m of the opinion that Morice consistently ‘gives bad history’ where the HBCo. is concerned. The motley lot that field officers of the HBCo. were forced to deal with in this era was a major factor in the poisoning of the management climate in New Caledonia. I am pretty sure that Morice was at Fort St. James when Peter Ogden was chief factor there (I’ll have to check my dates). There are a few stories… Many of these stories he might have heard from Peter, who was present on the brigade trail when Fraser died at Kamloops (or at least I think he was). He would have heard these rumours first hand, or these might have been his theories.